My son isn't usually interested in painting, so I took advantage of the small moment that he was. Even if he doesn't grow up to be an artist (I think an engineer would be more likely), I still want my little boy to appreciate art and understand a little of what I'm so passionate about. How do you get your kids involved in your interests and hobbies? If i'm doing it they want to have a go but this may change as they get older. The picture of your son is so cute. He even knows how to hold the brush. What you're doing is perfect--letting him join in and try something you're doing. It's important to let kids try out all sorts of experiences to see what captures their fancy. As time goes by, you'll both learn what his aptitudes and interests are, and can explore those areas more in-depth. But by dabbling in all sorts of areas you're saying to them it's ok to enjoy this activity, even if you're not a genius at it. Later on he might draw on that experience to get back into it in some way. For instance, my son has always been very poorly coordinated. When he was 6 he became captivated by Irish dancing and begged to take lessons. He discovered very quickly how difficult it was, and he didn't have the natural skill to do it. He wanted to quit. I made him stick out the series of lessons because I didn't want to see him give up so easily and I hoped he'd catch on eventually. He never did. Later I felt guilty for forcing him to finish out the year doing something he didn't enjoy. Surprisingly, he got into techno music (not sure I have the right name for a genre of music I don't listen to), and often goes to concerts. And dances! He loves dancing, although not the formal, intricate Irish style of dancing but a more individual, free style form. I was reading a book about the particular vision problem he has, and it mentioned that people with this problem enjoy dancing. Who knew. I also thought my son would become an engineer and even sent him, as a teen, to a two-week "explore engineering" camp. He came home and announced he didn't want to be an engineer. (Yikes, the money I spent to find that out, but better that than after four years of college.) He found his passion in life in another area of science, and is doing well at it. You just have to keep giving kids a variety of interesting activities to do, and never see anything as a failure, but an exploration. If nothing else, you develop an appreciation for a subject if you try it first hand, even if you're not good at it. You might consider giving your son a bigger brush, like a house painting brush, bigger paper, and maybe bold, thick tempra paint. Let him use his big muscles instead of his small muscles like you're doing. 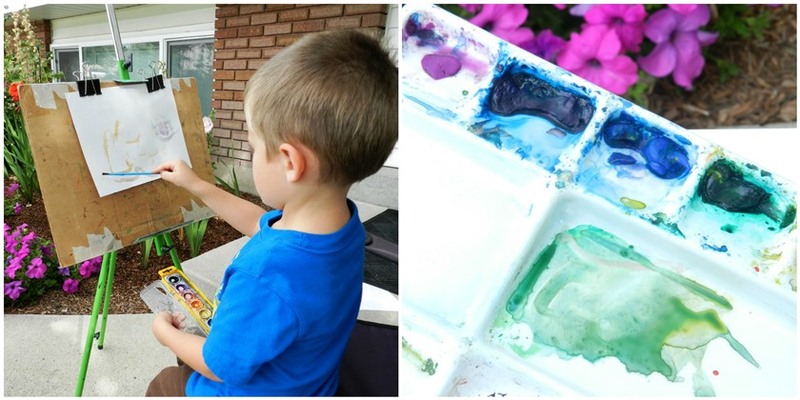 Or wet the paper and let him explore what happens when you put drops of paint on the wet paper, or try adding salt to it. Or roll marbles in paint and roll them on paper. You could let him paint the sidewalk with water and a big brush. Let him mimic your exploration of painting, but with other methods. How I wish I'd spent more time letting my son paint. Wall to wall carpeting in every room, and no "play room" made me avoid messy crafts. I should have done more outdoor crafts like you.